This is an example of the Gemstone Healing section in Lumari's Guide to Crystals and Gems. The section features pages, of Healing Correspondences words with the gemstones and crystals that hold, attract or impart those healing qualities and focus on those areas of healing. 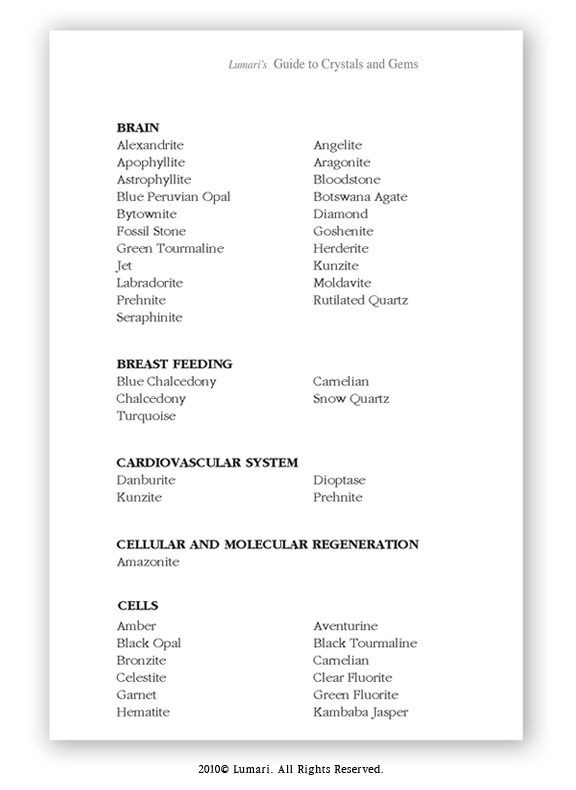 As you can see, one of the Gemstone Healing Correspondences listed here is Brain. The crystals that help, stimulate, increase or correspond to the healing of the Brain and Brain function are listed below that word. Angelite, Bloodstone, Diamond, Jet and Moldavite are a few of the gems that work with and help the Brain. You can just look up the Healing Correspondence in the book and discover all of the crystals and gems that work with that quality or property for healing. There are over 200 Crystals and Gemstones featured in this section alone organized in over 75 Healing correspondences! Copyright ©2010 Blue Star Network. All Rights Reserved.